Added on March 18, 2012 by Ken Maldonado. 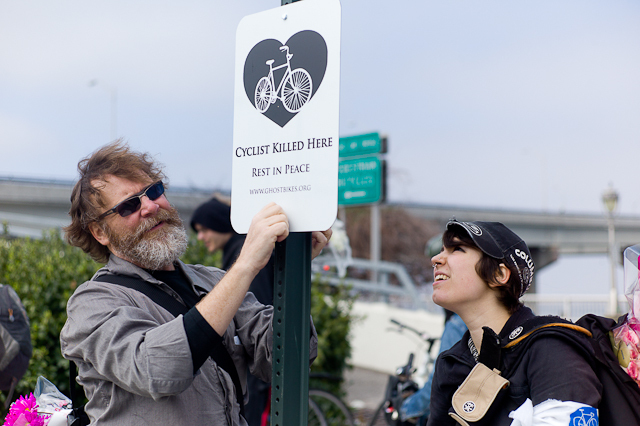 Curtis Anderson and Leah Todd of ghostbikes.org place a sign at the intersection of Cross Bay Parkway and Beach Channel Drive where cyclist Andrzei Wiesniuk was struck by a vehicle and killed August 2nd, 2011. The placing of the memorial kicked off the 7th annual memorial ride where cyclists visit several locations where other cyclists have been killed in motor vehicle accidents.